With the granddaddy of Midwest races, the Bank of America Chicago Marathon, filled for 2015, dozens of options remain for Chicagoans looking for full or half marathons close to the city this fall. Whether you need a warm-up race for Chicago, Twin Cities or another October marathon or you just want to experience something new, we’ve made your search easy with this rundown of races that experienced runners rave about. Chicagoan Jenny Poore casts her vote for the Peapod Half Madness, now in its eighth year. The Peapod Half Madness takes runners along the Fox River through downtown Batavia, about an hour west of Chicago. After the race indulge in pizza and Sam Adams beer. A great Labor Day half marathon just 30 minutes from Chicago, the race starts on wide city streets before taking a turn to a wooded path and through the sprawling McDonald’s Corporate Campus. It also includes stretches on soft crushed gravel (relief for those with gimpy knees) and paved bike paths, a mix of surfaces that breaks up the monotony of your run. Just 1,000 runners share the route with you, creating a great boutique race atmosphere close to the city. Bored of road races? Then take a drive a couple of hours north Sept. 19 and change up your terrain at the Lapham Peak Trail Races in Wisconsin’s Kettle Moraine State Forest. Trail runner Russell Delap started this series of races four years ago after growing tired of running the same old road races year after year. The beautiful course follows a winding path through the forest that provides a serious challenge. The half marathon course record is 1:31:15, about 20 minutes slower than a typical winning time at a half marathon run on roads. 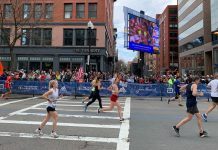 The day includes four races—a 5K, 7 mile, half marathon and full marathon—and is capped at just 500 participants for all events. Yes, you can find runs along Lake Michigan every weekend, and while many of them follow the same route, this one is different. The Chicago Half Marathon actually shuts down Lake Shore Drive for this Sunday morning run, eliminating the roar of traffic that can overwhelm the scene on the lakefront. Nearly 8,000 runners get traffic-free views of the skyline and the lake as the run takes around Jackson Park, Hyde Park and other southern portions of Lake Shore Drive. Another bonus: since it’s an out and back course, the amateurs among us actually get to see the elite runners sprinting to the homestretch! Indiana’s capital city has earned a reputation for hosting great sporting events, whether it’s the Final Four, the Indy 500 or the Super Bowl. Add marathons to that list! Runner’s World named the Indianapolis Marathon a Top 10 race to run in 2015. This race, which starts and finishes about 20 minutes from downtown Indianapolis near Lawrence, Indiana, takes great advantage of its surroundings. Stride through Fort Harrison State Park drenched in the colors of autumn, and finish with a fully stocked post-race event. Live music, fire pits, and a free post-race meal make for a phenomenal Midwestern fall Sunday. With just under 2,000 participants in the marathon and half marathon, you’ll get a big city race without the congestion. Plus, at $69 for the half and $79 for the full through Sept. 30, the race costs less than many Chicago races. Chris Ponteri says it’s time for Milwaukee to claim its own urban race. This fall, Ponteri, who also organizes the Icebreaker Indoor Marathon at the Pettit National Ice Center, aims to change that with the first Milwaukee Running Festival. The weekend includes a 1 mile, 5K, half marathon and a full marathon. Ponteri aims to draw 6 – 8,000 runners in year one. Several runners raved about this race in Lake Mills, about two and a half hours from Chicago. If you’ve tried Tyranena at your local watering hole, you know the beer is good, but the race is great too. “We try to run a very organized event, to make it an experience more than just a run where people finish and leave,” race director Stacey Schraufnagel says. 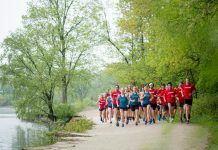 The run is capped at 1,500 participants who get a tour of the beautiful Lake Mills area before returning to the brewery for a full meal, plenty of craft beer and free brewery tours. The small size of the race makes winning age group awards—awesome Tyranena beer mugs—a little easier. Entering its third year, the Healthy Driven Naperville Marathon and Half Marathon takes runners along the riverfront in one of the more scenic suburban downtowns in Chicagoland. 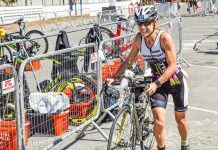 The 2014 races featured just over 4,600 finishers, big enough to make it feel like a major event but small enough to maintain a community race feel. If you missed out on registering for the Bank of America Chicago Marathon, this is a great fallback option in the Chicagoland area and includes free parking by the start line. If you do run Chicago, keep your running momentum going with the Naperville Half Marathon. The Madison Marathon takes advantage of one of the most beautiful mid-sized cities in the Midwest. This race used to be held in May, but after the race was canceled due to extreme temperatures, organizers moved it to November and are glad they did. “We’ve got fall colors, great course support form college students and the excitement of a college football Saturday energizing the city,” Rita Kelliher of Madison Festivals, owners of the event, says. The race begins and ends at the Capitol Square, the highest point in the city. That means the course includes some hills, but also takes you on a tour of the city, winding through the University of Wisconsin’s campus and past Camp Randall Stadium, among other landmarks. The race isn’t too big either, with 1,500 runners in the marathon and 2,500 in the half marathon.